A small-town boy from Maine who once rushed to the library to read the latest National Geographic has been honored with Shanghai's highest award to foreigners for the work of international medical charity Project Hope. Dr John P Howe III, internist and cardiologist, has seen a lot of the world and helped a lot of people since becoming president and CEO of US-based Project Hope (Health Opportunities for People Everywhere) in 2001. 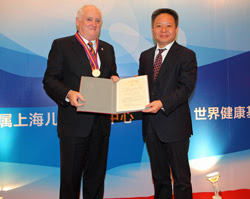 In September, Howe received the city's prestigious Magnolia Award for his contributions through the Shanghai Children's Medical Center (SCMC). It opened in 1998 with US$37 million in medical equipment from Project Hope. Today the center is one of China's leading pediatric hospitals and one of the world's premier pediatric heart centers. Hope continues to donate equipment and sponsor SCMC doctors for overseas training. Project Hope, founded in 1958, has programs and offices in 35 countries. Its most visible symbol at one time was the US Hope, a converted US Navy hospital ship that sailed the world, delivering badly needed medical treatment, training and health education. Today, its operations are land-based. In 1983, Project Hope became the first international non-governmental organization to partner with China's Ministry of Health to improve the healthcare system. Today it has 13 programs in China and is involved in children's health and cardiac surgery, diabetes, HIV/AIDS and training of doctors, nurses and health professionals. "As a doctor, you save people one by one, but in Project Hope, you can save a lot of patients," Howe said of the difference between being a doctor and being a CEO. He was interviewed by Shanghai Daily after receiving the Magnolia Award, given annually to a number of expatriates and foreigners. "Of course, working for Project Hope is a tougher job," he said. "The hardest part is matching our resources with the needs of the world. Every day I am involved in fundraising." Howe praised the work of Chinese and American healthcare professionals who contributed to the success of the Shanghai Children's Medical Center. "The highly specialized, excellent care of young patients at SCMC is an indication of how Project Hope's mission of training local doctors, nurses and health professionals can help build stronger communities for generations to come," he said. The hospital also shows how cooperation between US groups and Chinese leaders can create expertise and enhance public health in a rapidly emerging country, he added. "Before 1998, the hospital didn't exist. When the city decided to create a world-class children's hospital to meet its commitment to children's health, Project Hope decided to become the partner." The children's medical center is one of Project Hope's biggest programs and every year it donates around US$1.5 million for equipment, training and academic exchange. It supports 16 training programs in diabetes, children's nutrition, child development, critical care medicine, cancer care and other areas. Project Hope also sends rural healthcare workers and professionals for training at SCMC. Every year more than 3,500 children receive surgery at the hospital for congenital heart defects. That's more than any other hospital performs, said Dr Liu Jinfen, president of the medical center, which also specializes in leukemia treatment. In 2011 the hospital was accredited by the Joint Commission International (formerly the Joint Commission on Accreditation of Healthcare Organizations) - the first Chinese pediatric hospital to receive such accreditation. Project Hope also works in rural areas, training healthcare professionals and donating equipment to hospitals.